TCG Büyükada in Aden, embarking the Turkish citizens on board. Photo: Official Turkish Navy photo. Today, the Milgem class Corvette F-512 TCG Büyükada evacuated 55 Turkish citizens trapped in Yemen. The corvette was deployed to the Gulf of Aden and was in the region since January. It is the first major operation for TCG Büyükada. This is also the first non combatant evacuation operation for any Milgem class warship. The ship has more accommodation that its crew but the spare bunks are not enough for 55 civilians. TCG Büyükada will disembark the civilians in Djibouti where a Turkish Airline airplane will bring them home. After the launch of the military operation in Yemen by the coalition forces under the leadership of Saudi Arabia, a meticulous work has been carried on for the evacuation of the Turkish citizens who are in Yemen and requesting their evacuation. During the whole process, ultimate care has been shown not to endanger the safety of our citizens, and a multifaceted approach has been pursued by considering all available options. 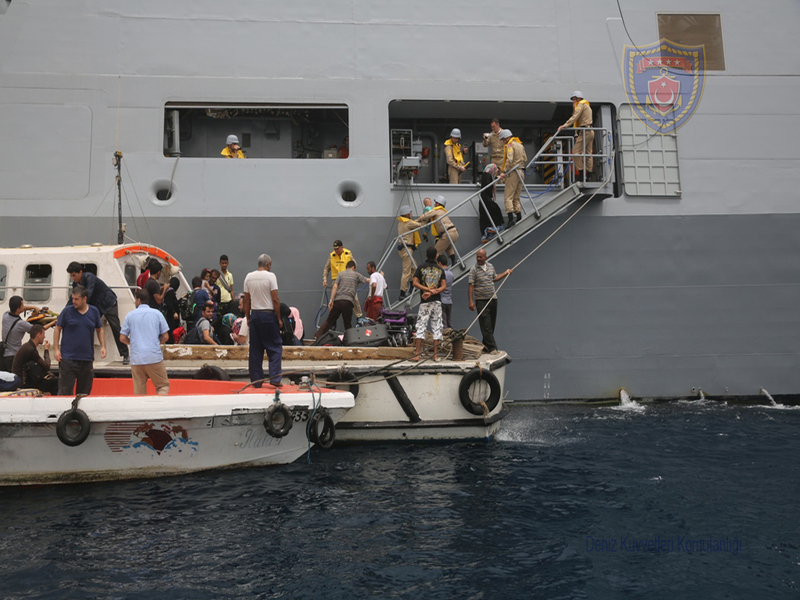 In this context, TCG Büyükada Frigate of the Turkish Naval Forces on mission in the adjacent waters completed the evacuation of 55 citizens who were in Aden. Our citizens will be taken firstly to Djibouti, and thence they will be transferred to Turkey by a Turkish Airlines aircraft. We welcome the safe and sound evacuation of our citizens from Aden thanks to the devoted and skillful efforts of our relevant institutions and the initiated coordination. Exactly at midnight of 23th March 2011, the Ukrainian Ropucha 1 class landing ship U-402 Konstantin Olshansky, departed from Sevastopol to conduct Non-Combatant Evacuation of Ukrainian citizens trapped in Libya. 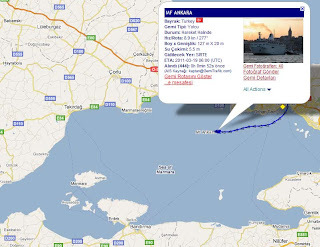 She has passed through Bosphorus on 24 March 2011 early in the morning and left Turkish territorial waters late at night. She spent a few days off the coast of Libya, while diplomatic arrangements for the evacuation being done. She docked in Tripoli on 3. April and picked up 210 evacuees. 129 are Ukrainian citizens and 81 are from Belarus, Libya, U.S., UK, Russia, Serbia , Moldova, Bulgaria, Kyrgyzstan, Romania , Malta, Slovakia, Uzbekistan, Iraq, Italy and Tajikistan. Currently she is heading to Malta. The Turkish civilian ferry M/F Ankara finally docked at Misurata port tonight according to Turkish Foreign Ministry tweets. 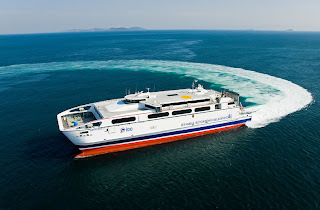 The ferry sailed from Çeşme, İzmir on 27 March 2010. For the last five days she was waiting off the Libyan city Misurata. The fighting in and around the city prevented M/F Ankara to dock at the harbor. M/F Ankara is loaded with 2 tons of medical supplies and 3 ambulances. On board are 15 healthcare professionals and a security detail of 10. In Misurata she will disembark her cargo and will pick up 100 – 200 wounded Libyans for further treatment in Turkey. The ferry will proceed to Benghazi after picking up the wounded Libyans in Misurata. 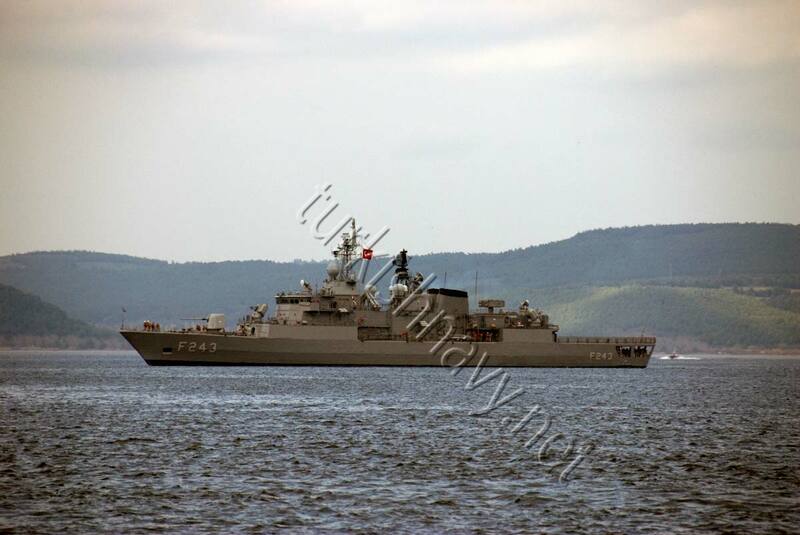 The Meko 200 class frigate F-243 TCG Yıldırım is escorting and protecting the ferry. In Çeşme a small field hospital is erected by Ministry of Health. Numerous ambulances are waiting to carry the severely wounded patients to the hospitals when the ship arrives in Turkey. 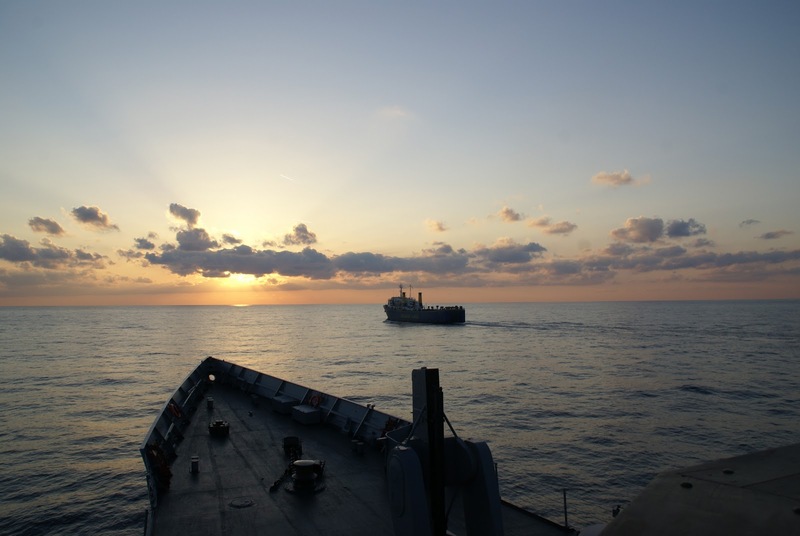 M/F Ankara is 25 miles off shore of Libyan city Misurata according to news reports. The civilian ferry left Çeşme, İzmir with 2 tons of medical supplies, 3 ambulances. On board are 15 healthcare professionals and a security detail of 10 too. M/F Ankara was supposed to dock in Misurata to disembark her cargo and to pick up 200 wounded Libyans and deliver them to Turkey for treatment. But the recent fighting in the city and the naval action just off the port prevented M/F Ankara from docking. The ship was 6,5 miles off the port, when she was pulled back by NATO warships as it was to dangerous to near the city where the clashes continue. On 28 March 2010, one US Navy P-3C Maritime Patrol aircraft, one USAF A-10 attack aircraft and destroyer DDG-52 USS Barry engaged Libyan Coast Guard vessel Vittoria and two smaller crafts after confirmed reports that Vittoria and accompanying craft were firing indiscriminately at merchant vessels in the port of Misrata, Libya. M/F Ankara will stay in region until the clashes in the city are over and it is safe to dock or the wounded Libyans will be transferred to M/F Ankara in high sea. 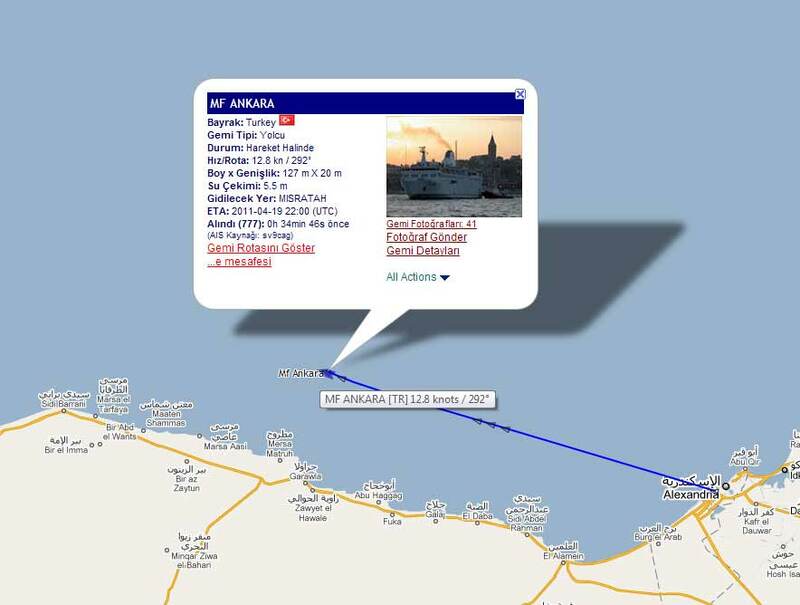 Turkish ferry M/F Ankara is heading to Misurata Libya according to an announcement made by the Office of the Prime Minister. She is carrying 2 ambulances and 2 tons of various medical supplies. On board are 15 healthcare professionals and a security detail of 10. When in Misurata, the ferry will pick up injured Libyans and bring them to Turkey for medical care. This is sort of breaking news. 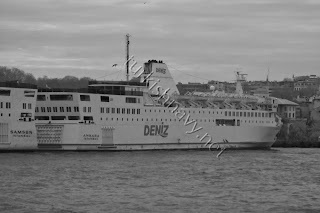 The civilian ferry M/V Ankara left Istanbul in the evening of 16. March 2011. Her possible port of call is Sirte, Libya. Her sister M/V Samsun is in Tripoli since 15 March 2011. She is evacuating Egyptians who flee from Libya. M/V Samsun and TCG Gelibolu in Tripolis. According to Turkish General Staff website, the ferry M/V Samsun arrived in Tripolis escorted by the frigate F-493 TCG Gelibolu. M/V Samsun will pick up Egyptian evacuees who wish to return to their country. This will be the second trip of the ship. In the first trip M/V Samsun had 1075 evacuees on board while TCG Gelibolu had 81 on board. There is nothing in the media yet but it seems the crisis on board of M/V Samsun is over. M/V Fehim Bey seen from TCG Gaziantep. In the meantime cargo vessels M/V Fehim Bey and M/V Purki arrived in Benghazi loaded with humanitarian aid. The ships departed from Mersin, Turkey for a joint aid action conducted by Turkey and UAE. The ships were escorted by the frigate F-490 TCG Gaziantep on their voyage. In my personal the the most important lesson that Turkey should learn from the Libyan NEO is that it is the high time for Turkey to invest in new, large, fast and seaworthy passenger ships. Compared to the evacuation by air the evacuation by sea was very limited. Only 8351 person, 36% of the evacuees, were transported by sea. This is direct result of Turkey’s lack of suitable passenger ships. The 5 ferries Turkey have sent to Libya were all the available and suitable ships that a country with a coast line of 7200 km could muster. There are no other passenger ships with a longer range, larger capacity or better accommodations under Turkish flag. Since the decommissioning Turkish flagged pure passenger ships in 1980’ies, long range cruise shipping is dominated by foreign companies such as Royal Caribben Cruise, Costa or MCS. And most of the local passenger shipping is limited to short hauled trips across the Marmara Sea. Therefore neither the government or the private companies invested in new passenger ships in the last decade. The three ferries M/V Samsun, M/V Ankara and TCG Iskenderun are similar ships built to a Polish Baltic ferry design. The first two were constructed in Poland and the last one build with Polish help in Turkey. They are slow. Their average speed during the trips was around 11 knots. 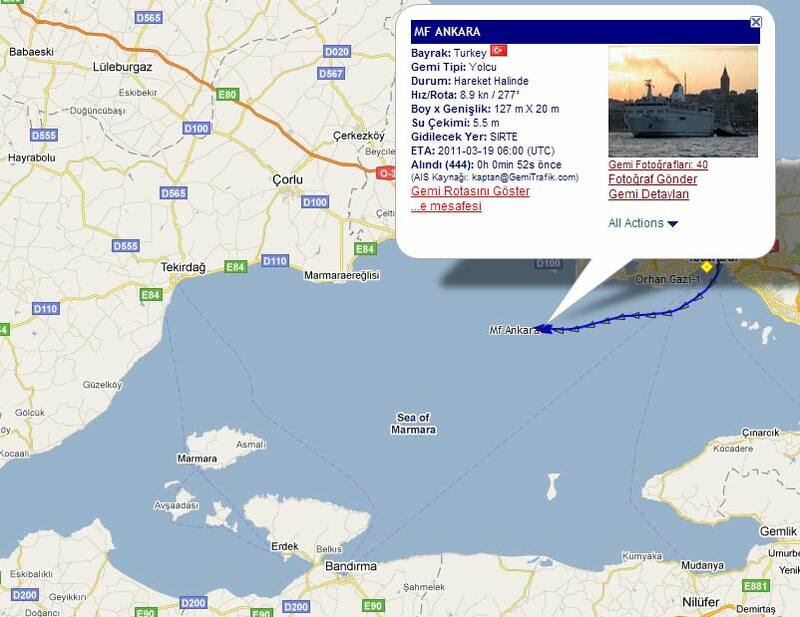 M/V Ankara needed 77 hours for its return trip from Benghazi to Istanbul. M/V Samsun is 28, M/V Ankara is 26 and TCG Iskenderun is 24 years old. Without any doubt they are reaching the end of their useful service lives. What would we do if the Libya crisis happened not today but in 5 or 6 years time. Where we forced to evacuate by using the fast ferries only? 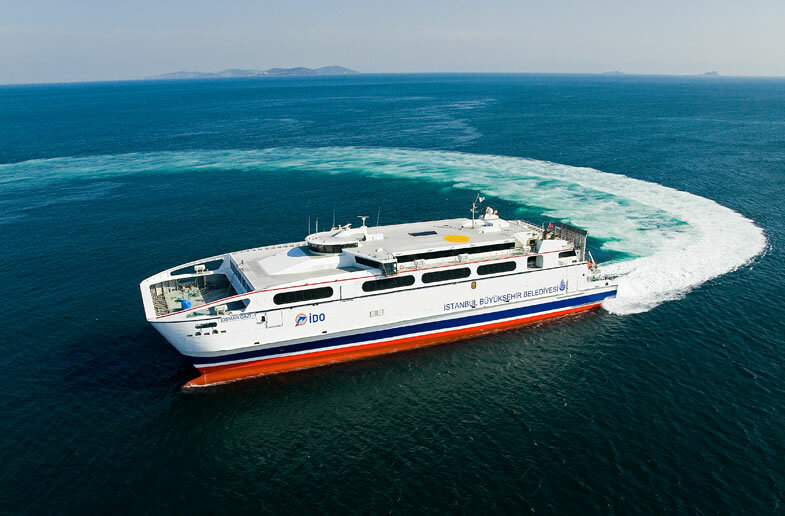 The Austral build M/V Osman Gazi and M/V Orhan Gazi are fast and modern compared to the Polish ferries. But these ships are configured for 2 to 3 hours trips from one side of the Marmara Sea to the other. They lack the hotel facilities the Polish ferries have and they are prone to bad weather more than the other ships. These ferries had to wait in Marmaris for 3 days until the gale in the Mediterranean wind down before they could start their second journeys. It is not possible to predict when or where the next Non-Combatant Evacuation Operation will be executed. But if the three previous operations can create an example it is safe to say that it will be in the Mediterranean. Therefore it is safe to assume that the next NEO will involve evacuation by the sea. Now it is right time to investing in new passenger ships and find an economical solutions or business ideas to operate and maintain them. Or otherwise for the next civilian evacuation we might to beg for ships.